The American West is full of public land, but private property is critical for conserving the region’s wildlife, open space, and other natural resources. Often located along biologically rich streams and rivers, private lands also serve as connective corridors between vast, undeveloped tracts managed by the Forest Service, the Bureau of Land Management, and other agencies. 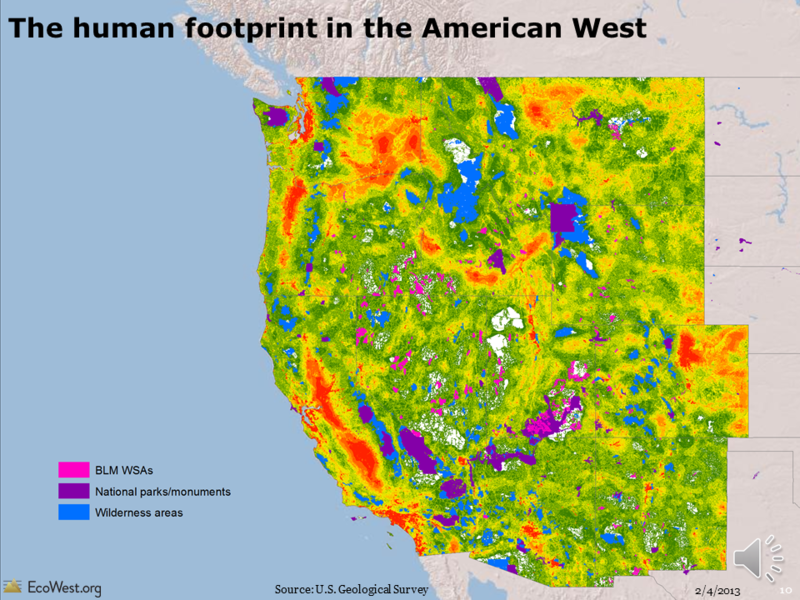 Because private property is so important for landscape connectivity, endangered species, and the overall ecological health of the West, land trusts have become key players in conservation world. These nonprofit organizations work with private landowners to protect valuable habitat and open space, often by creating conservation easements that perpetually prevent harmful development on the property. By the end of 2010, land trusts had conserved some 47 million acres, an area more than double the size of all the national parks in the contiguous United States. The figure has increased by 10 million acres since 2005 and it has risen by more than 100 percent since 2000, when 23 million acres were protected. Every five years, the Land Trust Alliance conducts a nationwide census. I’ve created some dashboards to illustrate the findings on this page. The slide show below summarizes the growth of land trusts from 2000 to 2010 and the geographic patterns in their activity (download links are at the bottom of this post). The growth of land trusts: 2000 to 2010 from EcoWest on Vimeo. 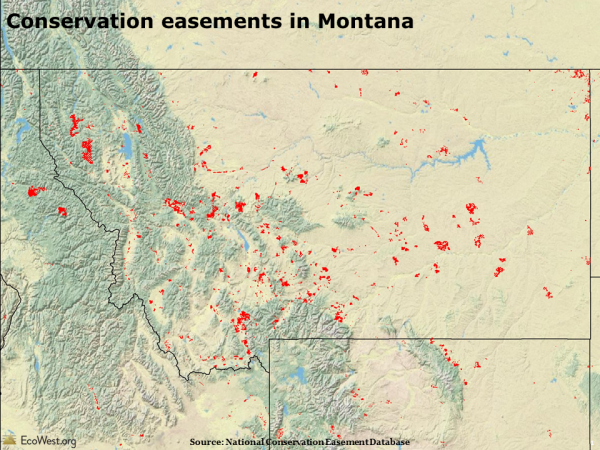 Conservation easements are the bread and butter of many land trusts. Easements permanently protect private land, but sometimes they allow limited housing, water use, and other development. There’s typically a tax benefit to these voluntary agreements. On a nationwide map, it’s hard to pick out the location of easements because the parcels tend to be small and scattered. 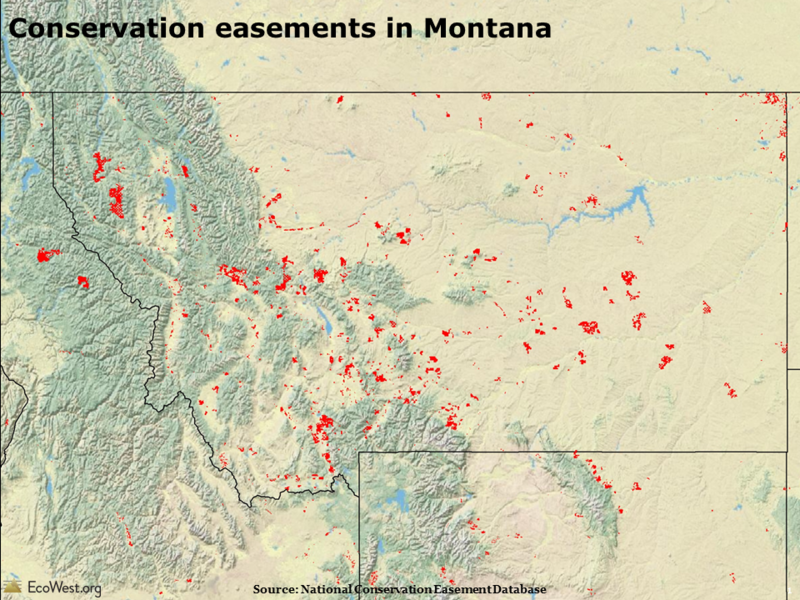 But in a state like Montana, you can see that they’re a significant presence. In smaller northeastern states, land trusts have been particularly active. In Vermont, 10 percent of the state is protected by land trusts; in Maine, it’s 8 percent. 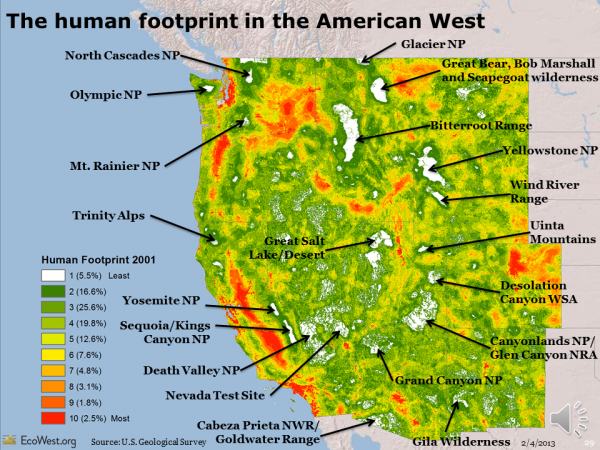 Out West, where many states are dominated by federal land, the figures are much lower, with California and Colorado leading the way at about 2 percent. Land trusts are found in virtually every state, but the highest concentrations are in California, the Northeast, and the Upper Midwest. In the West, Colorado and Washington each have more than three dozen land trusts, but many inland states, such as Nevada, Utah, Wyoming, and New Mexico, have fewer than 10. 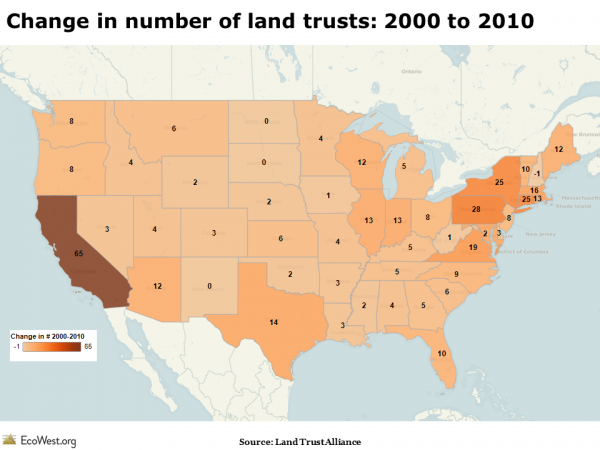 The map below shows the change in the number of land trusts from 2000 to 2010. You can see that California was far and away the leader, with 65 new land trusts created. Arizona gained 12 in the first decade of the 21st century, while Oregon and Washington each added 8. In terms of acreage protected, the greatest increase was in Maine, where nearly 1.7 million acres were added. 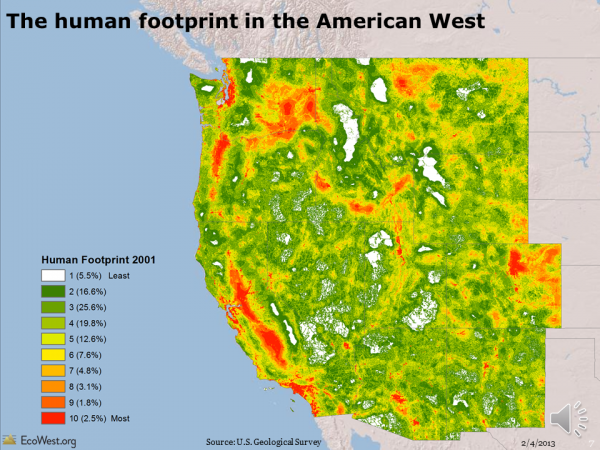 Out West, California, Colorado, and Montana saw the biggest rise. Land trusts come in all shapes and sizes, but there is a growing movement in the field toward accreditation to ensure the organizations follow best practices for finance and governance. Since 2008, more than 135 land trusts have been accredited. About two-thirds of land trusts that are eligible but haven’t yet applied for accreditation say they are planning to do so. Many accredited land trusts are found in the West, with California, Colorado, New Mexico, and Nevada leading the way in the region. The Land Trust Alliance is the go-to source for information about land trusts. You can download the data from the census they conduct every five years on this page.